What a night in New York City! Brookgreen and Robin Salmon, our Vice President of Art Historical Collections, were recognized with the Gari Melchers Memorial Medal from the Artists’ Fellowship at the National Arts Club in New York last night. This medal traditionally is awarded to "a person or organization that has materially furthered the interests of the profession of the fine arts." Trustees Sandy Scott and Hal Holmes spoke on behalf of Brookgreen Gardens and Robin. Their wonderful remarks (see the transcripts below) highlight the importance of Brookgreen and Robin’s leadership in supporting artists. The Artists’ Fellowship is a non-profit organization established in 1859 that provides support for artists in need. Since 1945 the Gari Melchers Memorial Medal has recognized individuals and institutions that contribute to the lives and work of artists. Brookgreen is honored to join national institutions like The Butler Institute of American Art, The National Academy of Design and the New York Foundation for the Arts, in this recognition and especially proud to be listed with Archer Huntington and Anna Hyatt Huntington who received the award in 1951 and 1967 respectively. Robin’s recognition by the Fellowship highlights the many relationships she has forged with artists throughout her 43 years of work at Brookgreen and in her volunteer work with the National Sculpture Society and other organizations. Congratulations to our remarkable colleague for this Award and the chance to celebrate it with so many friends in the field. The Fellowship also awarded the Benjamin West Clinedinst Medal to Brookgreen friends, sculptors Marc Mellon and Babette Bloch. Babette’s work along the Lowcountry Trail brings Brookgreen’s history to life. In their recognition they also spoke about the importance of Brookgreen to the art community and their personal connection to the Gardens. Congratulations to both of these incredible artists for this well-deserved honor. I met Robin Salmon 30 years ago at Brookgreen Gardens in Murrells Inlet, South Carolina. It was a fairly brief meeting, but we reconnected three years later in Loveland, Colorado at an outdoor sculpture exhibition. Over the years, we’ve become as close as sisters: we’ve stayed in each other’s homes, talked art into the wee hours of many mornings, laughed and cried together, and shared countless memories. 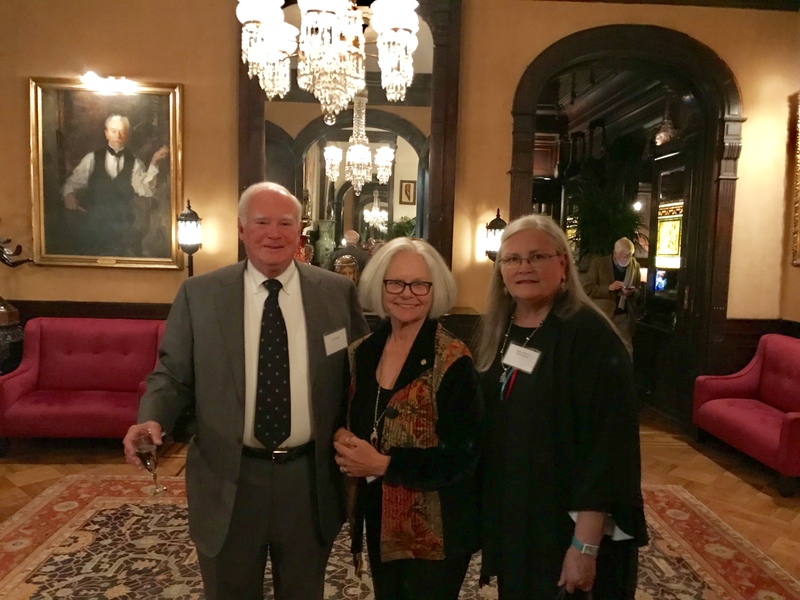 Robin called me earlier this year – very excited – and told me she and Brookgreen were to be awarded the Gari Melchers Memorial Medal at the Artists’ Fellowship’s 159th awards celebration here at the National Arts Club. I was humbled and thrilled when she asked me to introduce her. The Artists’ Fellowship is all about the art of giving and I know of no more deserving and giving individual in the arts than Robin Salmon. She is a born and raised South Carolinian, a true southern lady with impeccable manners and social graces – I’ve only heard her swear once, and I’m not at liberty to tell you why and what it was about. When she called, I asked: “What would you like me to focus on when I introduce you?” In her typical way, she unselfishly asked that I focus on her friendships with other artists – how she has brought living American sculptors to Brookgreen. Robin has tirelessly served as Brookgreen’s Vice President of Art and Historical Collections and Curator of Sculpture for 43 years. She has traveled west over the years to introduce and promote the splendors and importance of Brookgreen to countless sculptors and art lovers. Robin is the museum’s greatest emissary. The founders of Brookgreen, Archer and Anna Hyatt Huntington, would have loved her. - Her passion and focus throughout her life have been Brookgreen and American figurative sculpture and she is respected in the field as contributing, lecturing, and writing on the subject. – She continues to grow the Brookgreen Gardens collection to a position of prominence in the museum field. Under her guidance, over 1,500 works has been added to the enormous collection which was initiated by the Huntingtons in the 1930s. - Importantly, she has established Brookgreen as a source of knowledge for sculpture conservation. The museum is staffed for and is routinely called upon for advice and services. - She has promoted the field of medallic art through the annual Brookgreen Medal Program. - One of Robin’s babies is the Master Sculptor Program. She has brought important American sculptors to Brookgreen to teach, lecture, and demonstrate as well as enhancing and establishing the careers of emerging and rising sculptors. Robin is respected and beloved by so many, particularly by my fellow sculptors. Her knowledge and sensitivity have been gained over the years by visiting countless artists’ studios. - She started, promotes, and oversees Brookgreen’s ongoing educational and sculpture workshop programs. - Since 1995, she has been a board member of the National Sculpture Society and as Exhibitions chairman, continues to carry the torch for American Figurative Sculpture. The NSS Annual Awards Exhibition has taken place at Brookgreen since 1999. - She has written countless exhibition catalogues, written five books, contributed to many more, and has lectured at prestigious institutions such as Columbia University, University of California-Irvine, and the upcoming conference of the International Society of Appraisers. - She routinely is called upon and contributes to the National Endowment for the Arts regarding selection of sculpture projects. Quite a career, huh? Oh, and in her spare time she collects Carolinian sweetgrass baskets and copper luster pottery. While her late husband, Grover, was a fellow bourbon lover, her favorite toddy is Chardonnay. Recently, while visiting with a new Brookgreen board member, the idea was proposed of having Robin followed around with a recording device. There’s not a sculpture nor a sculptor in the collection that she does not know about, no matter who or how obscure. She always has information or an anecdote. She is a walking encyclopedia and the true historian of Brookgreen Gardens. In closing, and as we tonight celebrate Robin Salmon’s illustrious career and contribution to the arts, let me add: Robin Salmon and Brookgreen Gardens have preserved for posterity the timeline and kept alive the narrow stream of figurative sculpture in the broad river of American art history. The Huntingtons’ vision is instilled and lives in the heart of my dear friend . . . Robin Salmon.